The mission will usher in a spaceflight program to validate MEMS - tiny microelectromechanical systems being developed under sponsorship of DARPA, the Defense Advanced Research Projects Agency. 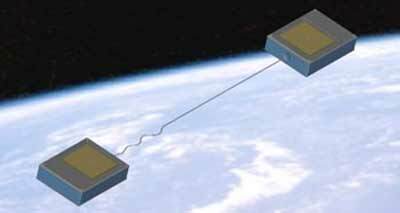 The experiment calls for two tethered picosatellites, each weighing less than one-half-pound and not much larger than a deck of cards, to be released into low Earth orbit by the OPAL satellite. OPAL is the Orbiting Picosat Automated Launcher built by Stanford University students at the school's Space Systems Development Laboratory. The primary goal of the DARPA/Aerospace picosasts on this mission is to validate microelectromechanical systems (MEMS) radio frequency switches designed by Rockwell Science Center, Thousand Oaks, Calif. Other MEMS devices are to be validated on subsequent picosat missions. The mission also is designed to demonstrate the principles of how constellations of nanosatellites, slightly larger than picosats, will operate in the future. The two orbiting picosats are to be tethered because they will communicate via micropower radios. The tether will keep them within range of each other for crosslink purposes. In addition, the tether contains thin strands of gold wire to facilitate radar tracking by U.S. Space Command. Concepts for the future involve optical communication via fiberoptic tethers and other cluster architectures for miniature satellites for which experience with tethers is useful. Another DARPA/Aerospace picosat mission involving a Minotaur booster and an Air Force Research Laboratory MightySat 2.1 satellite was conducted in July 2000. Plans call for the picosats to be released on command from MightySat 2.1 after spending specified time on orbit. A more complex mission followed in 2003.